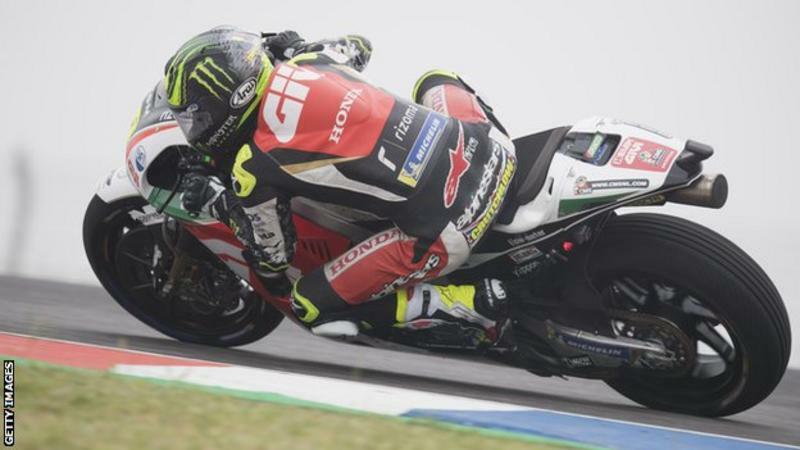 Britain's Cal Crutchlow said a race win was "expected" after he claimed his third MotoGP victory in Argentina. Victory means LCR Honda rider Crutchlow, 32, is the first Briton to lead the championship since Barry Sheene in 1979. "That was not a tricky race to be honest," said Crutchlow. "I said that I wanted to win races this year." Champion Marc Marquez finished 18th after being given a 30-second penalty in a race that was delayed by rain. The four-time champion started at the back of the grid for riding the wrong way down the track before the delayed start, and was given a ride-through penalty for a dangerous manoeuvre. He then clashed with Aleix Espargaro and seven-time winner Valentino Rossi, sending Rossi off his bike. The Italian finished in 19th. After the race Marquez approached the Yamaha garage, presumably to apologise to Rossi, but was ushered away by team staff without speaking to the 39-year-old. Briton Bradley Smith and Marquez's Honda team-mate Dani Pedrosa failed to finish at the Autodromo Termas de Rio Hondo in Santiago del Estero. Crutchlow added: "It was nice to win but it was to be expected. I thought I could leave the weekend being first or second with Marc Marquez. "I took no risks; I stayed out of the slipstream. My front tyre was melted. We have to be pleased the team has done a fantastic job. "We could have fought for a win no matter what the circuit was this weekend. We go to Austin and we have to aim for the top five," said Crutchlow of the next race weekend in Texas from 20-22 April. "A satellite team leading the championship, we are really pleased. The bike's working really well. "I had a great winter in California. It shows you don't have to do press-ups and pull-ups all winter to win races." Italy's Andrea Dovizioso, who won the season-opening race in Qatar, finished sixth.